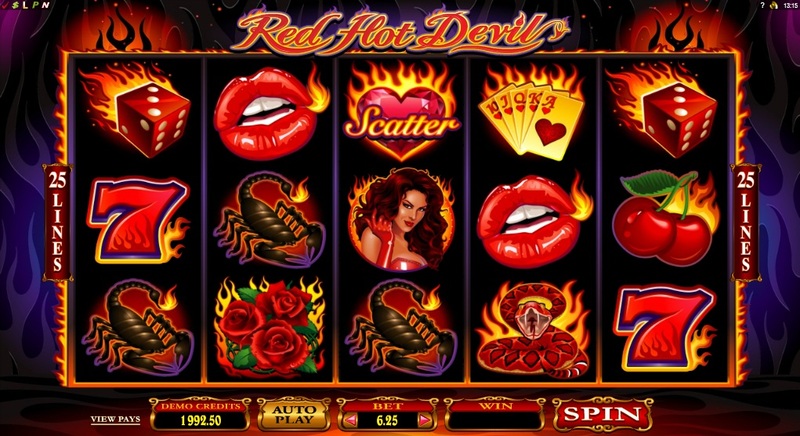 As attention was drawn to the big name sequel slots releases of South Park – Reel Chaos from Net Ent and Foxin' Wins Again by NextGen Gaming, Microgaming slipped under the radar with this follow-up slot to its popular Devil-themed Burning Desire slot. Red Hot Devil, at first glance, looks like a carbon copy of its predecessor. In fact, when it was released and I looked at it I honestly thought it was a re-release or re-branding of Burning Desire. Maybe that is why Microgaming opted for a completely different name for this new slot. Anyway, whether Microgaming planned for this to be Burning Desire Mark II or Burning Desire 1.5 or what not, the visual comparisons are a given at first look. 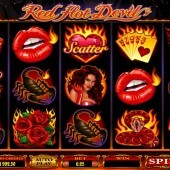 This slot is a 5 reel, 25 payline title and, as was the case with Burning Desire, every symbol is outlined by flames. It is possible to win up to 420,000 coins on this slot and that alone is worth paying attention to. The symbols on this slot all have some kind of Devlish depiction. They include a scorpion, a snake, a trident, dice, cherries, playing cards, roses, number 7s, lips, and our female star from the title, a She-Devil! The Wild symbol is represented by the Red Hot Devil logo and this will substitute for all other symbols, except for the Scatters, to complete winning combinations and aid you in winning some big pay outs. It should be noted that it does only appear on reels 2, 3, and 4. The burning hearts (sadistically symbolic!) act as the Scatters and these symbols trigger one of three bonus features that you can choose from. If you pick the free spins bonus round, you will instantly receive 10 free spins when this free spins bonus round is triggered and your multiplier value depends on the number of Scatters used to trigger the free spins bonus round. If you trigger the free spins bonus round with five Scatters then you can earn a multiplier value up to 10x. It is also possible to re-trigger the 10 free spins by hitting the Scatters on reels 1 and 5 at the same time during the free spins bonus round. If you opt to choose the Wheel of Fire then you will be taken to a second screen that shows ten fiery orbs. You then simply have to pick the right orbs to reveal prizes. However, if you reveal a joker symbol then the feature will come to an end. You can also earn up to a 3x multiplier on this bonus feature if you trigger it with up to five Scatters. If you decide to choose the Red Hot Wild Reels then you will be immediately rewarded with 10 free spins. On each spin, either reel 2, 3 or 4 will turn entirely Wild giving you more chance of completing winning combinations. If you hit a Scatter symbol on reels 1 or 5 then that reel will turn completely Wild too. If you hit Scatters on reels 1 and 5 then both of those reels will turn entirely Wild and you will also be awarded with 10 extra free spins. I wasn't the biggest fan of Burning Desire and although there has been no great push by online slot developer Microgaming to admit this is a sequel to that slot, it is pretty clear that the two slots hold more than a few similarities. Red Hot Devil is a totally new concept though. The amount of bonus features available and the winning potential just makes this an entirely different proposition to Burning Desire and this slot has fast become one of my “must play” slots of 2014. It appears 2014 wasn't just all about the epic Terminator 2 slot for Microgaming.